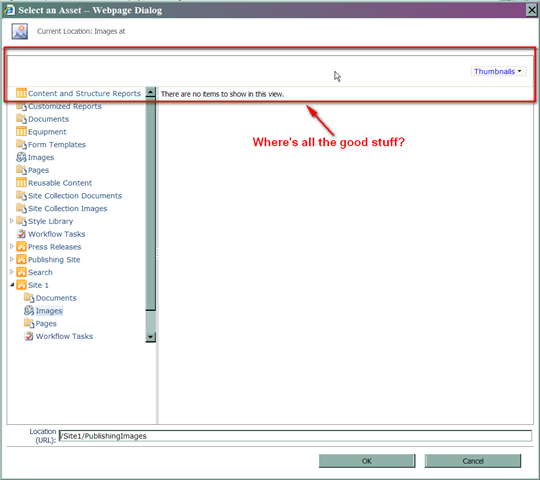 Toolbar Above “Select an Asset” Webpage Dialog Missing in SharePoint 2010 | Are you a user? I’m seeing this on multiple SharePoint 2010 installation when dealing with a publishing site. Colonel Forbin has posted this issue on social.msdn.com. When adding a picture to a publishing page and navigating through the dialogs, there used to be an upload feature on this dialog. It seems that it’s not appearing for some reason. Anyone else seeing this? Have not looked at this in quite some time. Not sure if it is still a problem.